Do we all say this: “How has the year already passed?” For the last two years I have set specific, measurable goals. Each year I’ve pushed myself. I’ve not been perfect, but good enough. I liked how the goals have changed me. I started throwing some ideas on a flip chart for next year’s goals. 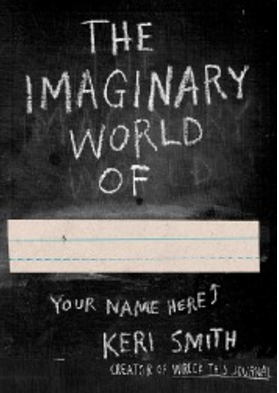 Keri Smith‘s book, “The Imaginary World of —“, popped into my mind. I’ve had it for two years, but have never done anything with it. It wasn’t even on the bookshelves, but hiding in a lidded bench. Who put it there?! It’s an intriguingly empty book, every few pages is another exercise to build my own imaginary world. It scares the beejezus out of me. Steph: You don’t ever write in books do you? Me: No. Never. I never even highlighted a book in college. Steph: I don’t think that’s what it is. Steph: You know there’s no wrong way to do it. Me: Yeah. But that doesn’t make me feel any better. Steph: If you write in the book, you become a part of it instead of standing outside of it. It’s a completely different experience. Writing inside it will change you in ways that even doing the exercises and writing them in another notebook couldn’t. Guess I’m going to do this next year. eep. I’m reading “My Stroke of Insight” by Jill Bolte Taylor. For some reason I’m struggling to get through it. I think my mind is refusing the concepts. “Why are you unhappy? Because 99.9 percent of everything you do is for yourself – and there isn’t one.” Wei Wu Wei. ‘’Indeed, everything that you have ever wanted, you are now supplying to others. And the wonder of it all is that, as you give, so do you receive. You suddenly have more of whatever you are giving away. *Thank you, Jan, for helping me find exactly where it was in the Conversation with God series. No self, no other, just all. Yeah. “Once you have made the commitment to free yourself of the scared person inside…” – Michael Singer, The Untethered Soul: The Journey Beyond Yourself. When I read that line, I had a physical reaction. Sound rushed in my ears, my throat constricted, my heart sped up. Almost my whole life, the story I told myself of who I am, is really not who I am. I thought I was a mean-angry person at the core, and I had been working for several years on letting her go. She was just the gate-guard for the scared person. Preparing to write this, I had a glimmer of thought that letting the mean-angry identity run my life, while protecting me, has had limited potential. It always had to keep an eye on the prime mission of hiding and protecting the scared person. Letting myself fully experience being frightened or being a scared person showed me a different person. A person I am actually more compassionate with than the mean-angry girl. This fear is not of anything that I’d label “animal fear.” Nothing is going to kill me or maim me. This is fear of ego and identity-self. An existential fear is the best way I can label it. It took a great willingness for me to experience that resisted identity. It doesn’t matter whether it comes unbidden or I set out deliberately to create and experience it. Only by experiencing it fully can I know that (a) it will not kill me (b) it is a creation just like everything else. What’s after that fear is experienced though is a “self” so wide and great and all encompassing it’s not explainable. Setting aside time to process allows me to know what it feels like, so when I encounter the leading edge of the feeling during the day, I allow myself to feel it. The funny thing is I expected allowing myself to feel fear to look like I was cowering in the corner all day. Not at all the case. It’s also not obvious to others what I’m doing, except that I am not covering something up. I have more compassion right now for those who let their frightened self out for all to see. It is still a bit repugnant for me to view – more opportunity there! A big thank you to the Avatar tools for enabling me to experience these feelings safely and without judgment. I love a book that makes me think, makes me question myself, and makes me look up stuff. Hanagarne is so refreshingly open and vulnerable throughout the whole book. This is evidence (hey, writers, pay attention!!) that the more personal and specifically you write, the more likely others are able to identify with you and your book. Counterintuitive only at a glance; when you think about it, it underlines the universality of the human experience. As a writer and avid reader I will always love books. I love every flavor of book from twenty-page poetry chapbooks to Plumbing How-to Guides to 700-page novels. I’ve bought plenty of spiritual (aka self-help) books over the years. I don’t think I’ve ever been given any, but I’ve given plenty away. My favorite books to give away include Illusions by Richard Bach, Conversations with God by Neil Donald Walsh, There is Nothing Wrong with You by Cheri Huber, Living Deliberately by Harry Palmer, and (new one) Daring Greatly by Brene Brown. Sharing a book that offered you insights is a great pleasure, especially when the person you gift comes back to you with gratitude. I’ve realized, though, that while reading the book sometimes does change the way you think, most of the time it is only a superficial, intellectual experience rather than a life experience. (I can’t tell you how many books warned me about that!) To get the full value of any spiritual book, I have to do the exercises, try the examples! Yes, there it is again: practice. Schedule a time to do the exercise or do it right then. Think about what I learned from the exercise. Honestly, I don’t do this with every book, and it can mean it takes a long time to finish the book. But if the author moves me, I know I will get much more from the book if I do what they suggest. I remember Thich Nhat Hanh describing how to do a walking meditation in Peace is Every Step. His words are very powerful, but I can’t quote any of them from memory. What I do remember very clearly is putting those words into action walking down the driveway and up the street, tears streaming down my face while smiling. I’m going to do that again right now.